A Medium user posted a Twitter analysis of the “100 Most Influential People in Crypto,” ranking the influencers on how vocal they are on bashing Bitcoin Cash. First posted in January 2018, the list provides a rare glimpse into how the who’s who of crypto feel about the controversial Bitcoin fork. Crypto Weekly, a cryptocurrency newsletter whose annual influencer lists made it one of the most popular newsletters in the industry, has seen its 2018 list resurrected by a recent tweet. Regularly updated, the list was first published in January 2018 and highlighted 100 individuals that are involved in crypto around the world. This year’s list hosted an eclectic mix of hackers, academics, engineers, and journalists, chosen based on several factors including contributions, technical innovation, research, and commentary. And while the list has remained the same throughout the year, it has seen a rise in popularity in the last weeks of October, as an interesting analysis of its data has popped up on Twitter. A Medium user going by the name Ash, analyzed the Twitter accounts of all of the people named in Crypto Weekly’s Top 100 list to see how they viewed Bitcoin Cash. The controversial cryptocurrency has been a divisive force among crypto enthusiasts since it split from the original Bitcoin blockchain on August 1, 2017. 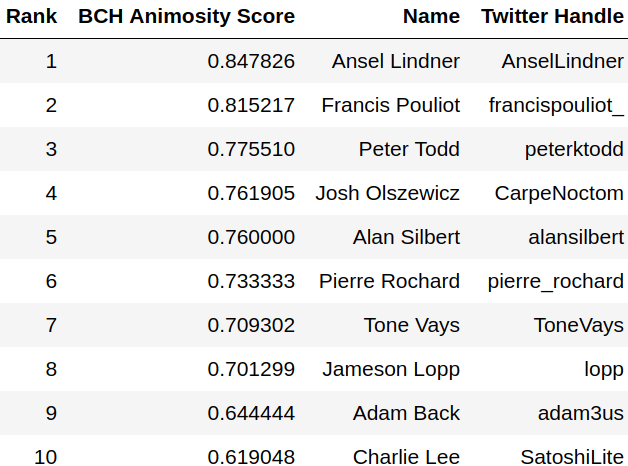 With many in the Bitcoin community finding Bitcoin Cash so so abhorrent that they’ve taken to calling it “bcash” to remove “Bitcoin” from its name entirely, Ash decided to create an “animosity” score to rank the influencers. The basic premise was that the more one referred to Bitcoin Cash as “bcash,” the more animosity they feel towards it. Therefore, by using a previously created DataFrame using Python 3, the user created a function that calculates the proportion of Bitcoin Cash mentions that are “bcash” for the Twitter accounts of each of the 100 people mentioned in Crypto Weekly’s list. Ash’s function gave each individual a BCH Animosity score between 0 and 1, with the closer an individual’s score is to 1, the more animosity they feel towards Bitcoin Cash. Francis Pouliot, founder, and CEO of Satoshi Portal was listed a the second most vocal anti-bcash influencer on Twitter, with a score of 0. 815217. The former director of research at Catallaxy came in a close second behind Ansel Lindner, host of the Bitcoin & Markets podcast. The top two vocal critics of Bitcoin Cash were followed by other Bitcoin enthusiasts such as Josh Olszewicz, Brave New Coin’s star writer and advisor to Altcoin.io. Other mentions on the list include Peter Todd, Alan Silbert, and Pierre Rochard, co-founder of the Satoshi Nakamoto Institute.